With your Rebel T6/1300D in Creative Auto mode, you can affect picture brightness and depth of field to some extent by using the Shoot by Ambience and Background Blur features. The scene modes let you request a slightly brighter or darker exposure via the Shoot by Ambience setting, but that’s pretty much it. So if you’re really concerned with these picture characteristics — and you should be — set the Mode dial to one of its four advanced exposure modes: P, Tv, Av, or M.
To fully control exposure and other picture properties, choose one of these exposure modes. P (programmed autoexposure): The camera selects the aperture and shutter speed to deliver a good exposure at the current ISO setting. But you can choose from different combinations of the two for creative flexibility (which is why this mode is sometimes referred to generically as flexible programmed autoexposure). Tv (shutter-priority autoexposure): You select a shutter speed, and the camera chooses the aperture setting that produces a good exposure at that shutter speed and the current ISO setting. Why Tv? Well, shutter speed controls exposure time; Tv stands for time value. Av (aperture-priority autoexposure): The opposite of shutter-priority autoexposure, this mode asks you to select the aperture setting — thus Av, for aperture value. The camera then selects the appropriate shutter speed to properly expose the picture — again, based on the selected ISO setting. 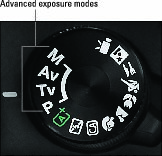 M (manual exposure): In this mode, you specify both shutter speed and aperture. To sum up, the first three modes are semiautomatic modes that are designed to offer exposure assistance while still providing you with some creative control. Note one important point about these modes, however: In extreme lighting conditions, the camera may not be able to select settings that will produce a good exposure, and it doesn’t stop you from taking a poorly exposed photo. You may be able to solve the problem by using features designed to modify autoexposure results, such as Exposure Compensation or by adding flash, but you get no guarantees. Manual mode puts all exposure control in your hands. If you’re a longtime photographer who comes from the days when manual exposure was the only game in town, you may prefer to stick with this mode. If it ain’t broke, don’t fix it, as they say. And in some ways, manual mode is simpler than the semiautomatic modes — if you’re not happy with the exposure, you just change the aperture, shutter speed, or ISO setting and shoot again. By contrast, when you use the Av, Tv, and P modes, you have to experiment with features that modify autoexposure results, such as the aforementioned Exposure Compensation. But even when you use the M exposure mode, you’re never really flying without a net: The camera assists you by displaying the exposure meter, explained next.